We pray a lot and Adah especially loves to pray over our meals, but this was the first time we encountered this question. And for a 4 year old or maybe even a new Christian, it makes sense to ask. Why? Because many in this world are serving a god that is dead or not even real and has no way of hearing their prayers. However, the God I serve is an omnipresent, omniscient God and is more than capable of not just hearing all of our prayers, but of knowing them beforehand. having complete or unlimited knowledge, awareness, or understanding; perceiving all things. I explained to Adah that God is everywhere. He’s in heaven and Poppa C (her grandpa), who passed away less than a year ago, is having so much fun with Him there. But He’s also on earth, here with us at all times. He sees us. He hears us. He walks with us. If we have accepted Him, He even lives within us. Later one night as I was waiting to fall asleep, I was also praying. I was thanking God that He sends His angels to keep charge over us (Psalm 91) and I was thanking God for His blood that covers us. Then I got really excited, because I realized (I already knew this, but it really hit me!) that even greater than those angels and blood was God Himself right there with me, in me, all around me! I pictured myself sort of in the middle of a giant God Bubble. How cool is that? That’s when it hit me…..play doh! I know, I know. Now you’re lost. 😉 But stay with me! I promise, it will make sense soon. God had given me what I feel like is a super neat way to explain His omnipresence to my girls using nothing but play doh (and a butter knife to be used by Mom). When you’re a kid, does it get any cooler than that?! 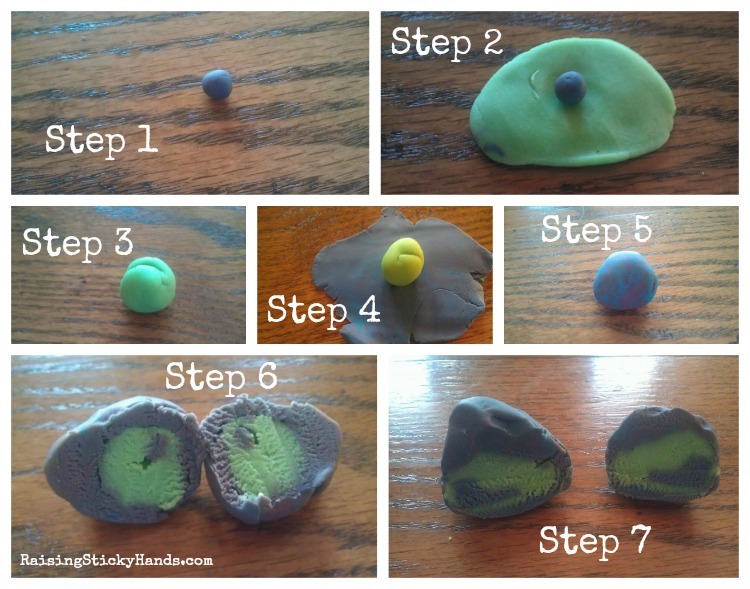 Step 1: Have your child pinch off a small amount of color 1 and mold it into a ball. Step 3: Once color 2 is flattened out, make a small indention in the center of it and place the small ball made from color 1 in the indention. Step 5: Have your child get an even greater amount of color 1 and basically repeat Step 3. Flatten it out like a pancake, make an indention in the center, and place the ball made up from color 2 in the center. Step 7: This is the last step, where you will use the butter knife. Cut down the middle of the final ball shape to cut it in half. When you do this, you will be able to see the inside, which shows the first two colors. This demonstration shows how God is every where around us at all times. How do we know this is true? Deuteronomy 31:6 and 8 as well as Hebrews 13:5 all state that God is with us and will not leave nor forsake us. If He will NEVER leave nor forsake us, then it must be true that He is ALWAYS with us. This is so comforting to know! No wonder we can walk in peace and not fear. Praise the Lord! This demonstration can also be used to show that God is watching everything we do and hears everything we say, good and bad. As it says in Proverbs 15:3, “The eyes of the Lord are in every place, keeping watch on the evil and the good.” It’s important that we strive to live lives that are pleasing in His eyes (This is for the Mommies, too, especially me!). Here’s a little secret- while this was a lot of fun with a great message for my girls, it was a message that I need to keep in remembrance. I am certainly thankful for our omnipresent and omniscient God!